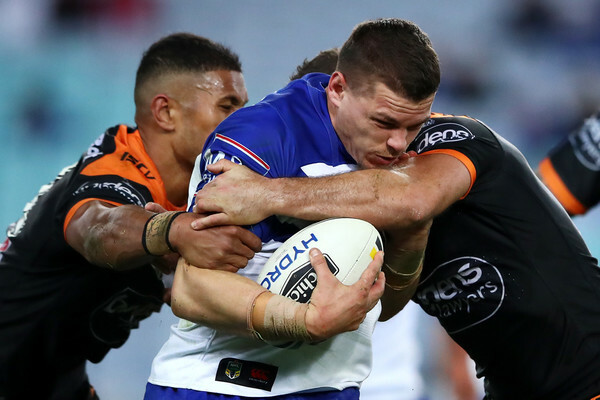 It was a bit of a drab match between the Bulldogs and the Wests Tigers at ANZ Stadium on Friday night, with the two teams only racking up three tries between them. While the Tigers were fresh off a brilliant win over the Bunnies the week before – one of the best examples of their defensive strategy this season – and the Bulldogs had only scored one try in their loss to the Eels in Round 20, there was no real sense of urgency to the match, which settled into long patches in which neither team was able to decisively take control. All in all, the Dogs were the best on the park, although Brett Morris didn’t set the scene well, knocking on the first high ball of the night from the Tigers a minute in, and then finding himself trapped in goal by a left-footed grubber from Robbie Farah on the next set, gifting the Tigers their first dropout at the three minute mark. The Bulldogs only got their hands on the footy five minutes in, when Will Hopoate cleaned up a Luke Brooks grubber beneath the posts. Galvanised to finally have possession, the hosts made no time in making their way up the field, as a linebreak from Reimis Smith saw them reach the Tigers’ forty on the first tackle. A touch from Elijah Taylor got them a repeat set, and Morris almost made up for his two opening gaffes by crossing over, only for an enormous trysaving effort from Moses Mbye and Robbie Farah to hold him up, with additional pressure from Esan Marsters and Ben Matulino forcing him to cough up the Steeden in turn. From there, a messy period ensued for both sides, including a pass on the ground from Taylor after a Canterbury tackle was clearly complete, and then yet another error from Morris. A deft grubber from Naiqama eluded Hopoate on the Tigers’ left edge, but the opposing fullback managed to just brush the ball into touch with the tips of his fingers before Corey Thompson stormed in to attempt to score. The Tigers still had another dropout, but they tried and failed to nose out any chinks in the ruck. Only Marsters looked liked breaking through, halfway through the tackle count, but the gap closed pretty quickly, and the set ended with a kick from Farah that went too far. This time, all Hopoate had to do was wait for it to skitter into touch, and once again the Bulldogs resumed possession with panache, as a pair of strong runs from Morris and Kerrod Holland got them back within the visitors’ twenty by the second tackle. Moments later, Jeremy Marshall-King chose to run the ball, setting Michael Lichaa up to shoot a quick cut-out pass across Luke Brooks’ chest right on the line. It found Holland on the chest, who seized his chance and ploughed through Naiqama and over the chalk before Mbye could launch in and clean him up. With Rhyse Martin adding the extras the Dogs were now 6-0, the scoreline that would remain in place until they trotted into the sheds at the end of the first half. The fact that Holland also scored the first and only try against Parramatta last week challenged the Bulldogs to come up with a better result this time, and a knock-on from Benji Marshall right on the line initially seemed to give them the opportunity they needed. Yet his brother made a mistake just as quickly, losing the footy on the first tackle of the next set, leading to a fairly underwhelming passage of play in which Canterbury were never quite able execute a tryscoring sequence. Meanwhile, the Tigers weren’t able to take advantage of the Dogs’ inability to capitalise either. Brooks showed some real patience to shepherd a Hopoate grubber into touch, getting his team a seven tackle set about fourteen minutes out from the siren. Yet Brooks was unable to really consolidate his last-tackle options, thanks in part to a pair of sterling defensive efforts from Josh Jackson. In one set, he sped up to put enough pressure on Brooks for the young halfback to deflect the kick; in the next set, he scooped up Brooks’ kick, and started heading back down the field. The last real chance that the Tigers got in this opening half came after a penalty from Aiden Tolman for holding Sausao Sue down on the third tackle, right on the line. But with Sue called offside shortly after, all of the Tigers’ field position came to nothing, as Naiqama helped the Bulldogs march the football back down the other end of the field, only for the blue and white to remain only six ahead by the time the siren rang out. Only a penalty goal augmented the scoreline over the first ten minutes of the next half, thanks to some holding down from Taylor that saw Martin boot through two more points for his team. Given the eventual scoreline, however, this was as important a turning-point as any, putting the Dogs beyond a converted try lead in a game in which only three tries would be scored, and only two converted tries, both of them from Canterbury-Bankstown. Fifty minutes in, the Tigers glimpsed a chance with a series of cut-out passes across to their right edge, only for an offload from Brooks to Marsters to go awry under some brilliant Canterbury pressure. A set later, Marshall-King sent the Steeden across to Jackson midway up the field, only for Jackson to pop it back inside to Hopoate just as quickly, in a kind of inverted catch-and-pass. The change in direction was too rapid for the Tigers to adjust, and by the time Hoppa had flicked it across to Holland both Thompson and Mbye were too late to prevent the young centre getting a double. With Martin continuing his near-perfect kicking rate, and Greg Eastwood making fifteen metres up through the ruck on the restart, it looked as if the Bulldogs could do nothing but consolidate from here. A single tackle changed all that, however, as Matulino put in the biggest hit of the evening on Lewis, as if prescient of all the extra work that the young halfback had been doing in the Bulldogs backline, where he was often acting as Hopoate’s wingman as much as a member of the halves. Like Inglis’ and Mitchell’s big hits in Origin this year, this tackle quickly halted Canterbury’s progression, even if David Klemmer trotted onto the field moments later. A set later, a mid-field kick from Nofoaluma looked set to sit up for Brooks, only for the Bulldogs to put in some scrambling defence to prevent the Tigers getting through. Nevertheless, Brooks was clearly pumped by this near-miss, echoing Matulino’s hit-up shortly after with a big hit on Klemmer, giving the visitors just that little bit more momentum as they coalesced in preparation for their first and only try. It came off the big of a big goose-stepping run from Nofoaluma at the start of the next set that seemed to absorb Klemmer’s signature gait much as Brooks had absorbed some of the big Bulldog’s attacking energy on the previous set. From there, an offload from Matulino to Farah, and a hard run and rapid play-the-ball from Packer, set up the final tryscoring sequence of the game. This time, Brooks and Marsters synced up on the right edge, but only with Benji as intermediary, as a quick pass from Benji sent the second-rower-turned centre through both Morris brothers to score in the corner. The last note was a kick for Martin two minutes out from the end following an escorts penalty from Nofoaluma. It was hard to know what to make of the match, since Canterbury were the strongest team and so should have won by more, but the Tigers hadn’t quite been good enough to make the most of such big gaps between Bulldogs points either. Both teams will be looking for a more consistent performance, then, when they take on Broncos and Knights respectively, especially the Tigers, whose position with respect to finals footy grows ever more precarious.